Radon is a naturally occuring cancer-causing radioactive gas that you can’t see, smell or taste. Its presence in your home can pose a danger to your family’s health. Hensiak Inspection Services, Inc. is a qualified radon testing service, serving the Racine County area. Radon is the leading cause of lung cancer among non-smokers and the second leading cause of lung cancer in America. The U.S. 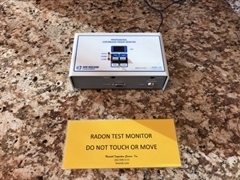 Surgeon General and EPA recommend that all homes be tested for the presence of radon. We have passed the certified proficiency testing requirements. We use electronic measuring devices that are placed in the lowest livable level of the residence for a period of 48 hours minimum, with the results immediately available at the end of the test. Home owners in the Racine County, Wisconsin area can rely on Hensiak Inspection Services, Inc. to provide accurate advice about any radon threat to your family. To learn more about radon and view a citizens' guide to radon, go to the Federal EPA website and search for "radon guide". If you do not see your area listed, don't worry, this is not a complete list.